To some people, chef coats are chef coats. If it's white, double breasted with ten or 12 buttons, and a military (Nehru, or mandarin) collar, it's a chef coat. They couldn’t care less about the construction, fabric, fit, or style. Their only concern is price. If price is your only concern, there are many culinary apparel manufacturers that mass-produce discount chef uniforms and cheap chef coats who will gladly sell them to you, and that is exactly what you will get. Since 1989 we have designed and manufactured uniforms for the world’s most distinguished and discerning chefs. They understand that price is a determinant of quality, and the relevance of price, quality, and value. They know appearances count and a well-dressed chef will convey the image of a professional who cares about details and presentation. All of our garments are made to order by master tailors and their assistants in the U.S.A. With our in house pattern making, logo digitizing and embroidery, over 450 embroidery thread colors, 55 piping colors, large variety of styles, dozens of fabrics (including Supima® and Certified 100% Organic Cotton Twill in 24 colors), and an extensive line of buttons to choose from, you can personalize your chef jackets in ways you never imagined. We have no desire to produce the most, only the best. The making of fine chef uniforms calls for time, care, costly materials, and painstaking inspection. The results are chef jackets that are truly works-of-art. Simply put, these are the highest quality chef coats on earth. The images below are examples of our chef coat and cook shirt styles in various configurations. 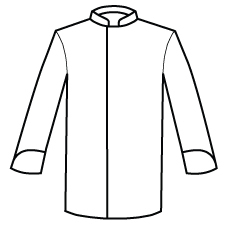 You may order a chef jacket or shirt the way it appears, or you may combine the different options (fabric, buttons, pocket, collar, cuffs, sleeves and piping) to create your own design. Click on the images to see the jackets' descriptions and prices.